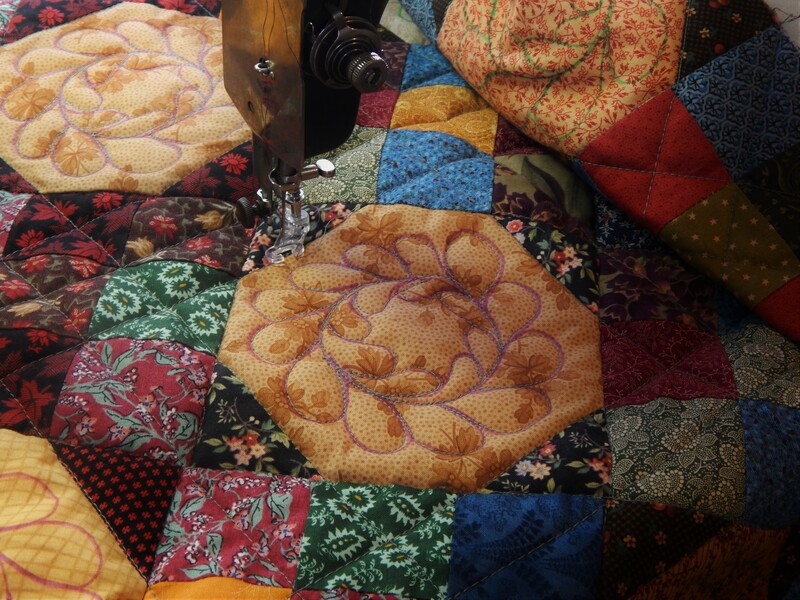 As you may have already guessed I buy a lot of vintage and antique quilt tops and blocks from eBay. (could this be an understatement?) One of the things about eBay buying is that sometimes you just have to take a gamble. I just got a lot of 20 star blocks and this is what the seller had for the description. 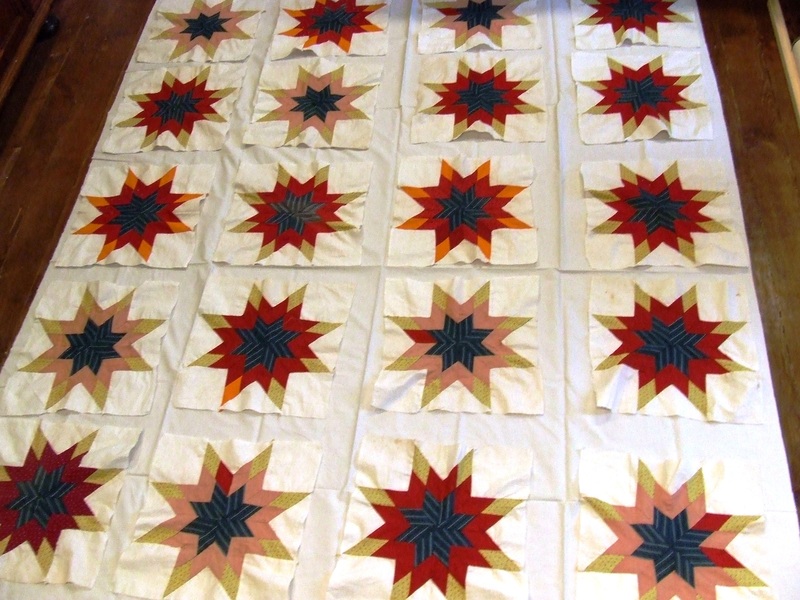 Lot of 20 handsewn vintage “8 pointed star” feedsack quilt blocks. They measure 15″ x 15″ each and are in nice vintage condition. 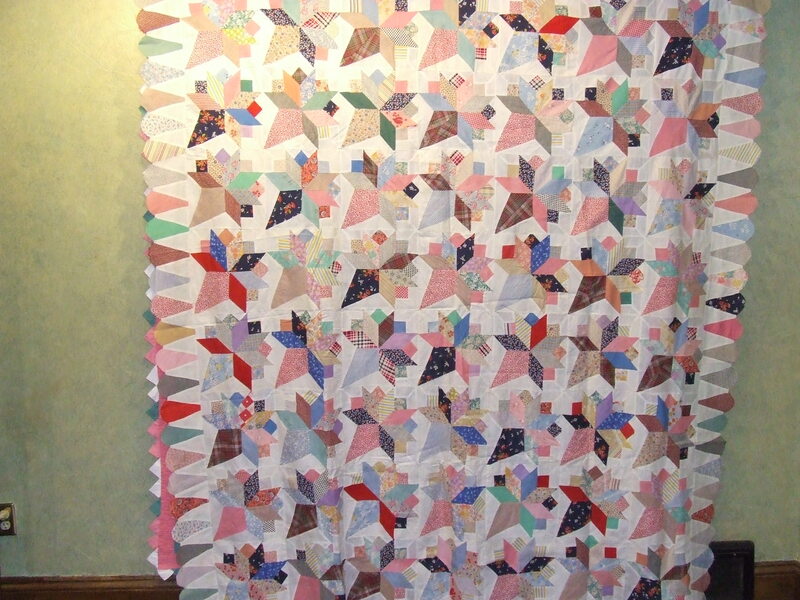 It looks like these were once either hand sewn together or maybe removed from an existing quilt. 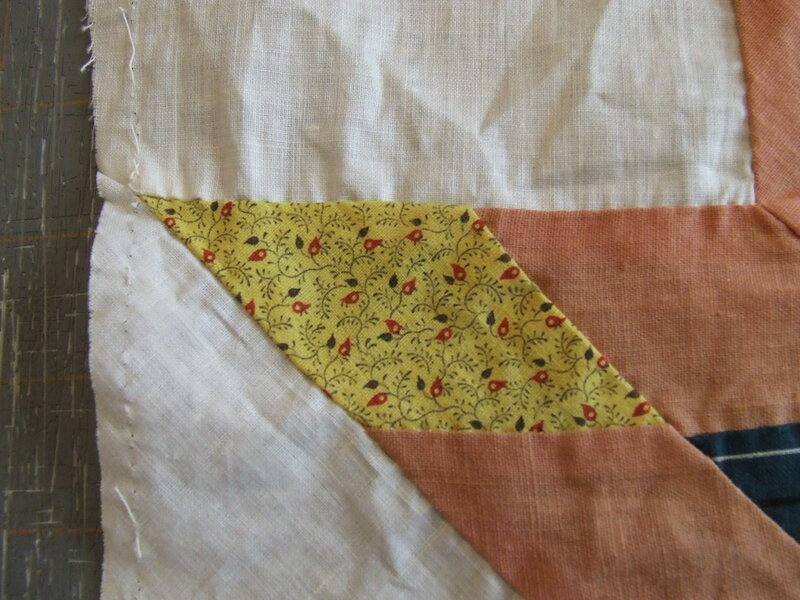 There is stitch marks around each of the edges of the blocks where they were once sewn to something? There is some light yellowing discoloration on the cream fabric background and very light fading of the dark green on one block only. 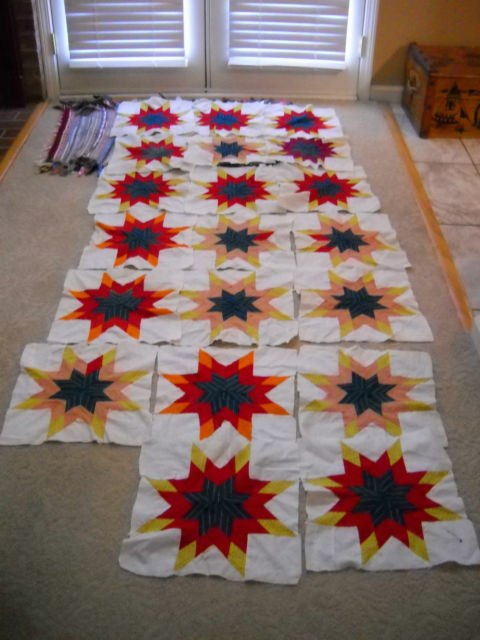 They are beautiful and would make an outstanding quilt!! There are however many people who sell on eBay and anything that is fabric and looks old becomes “feedsack” even when it is not. So I took a gamble and bought them $26…..that is $1.30 per block! Hope they are good…well I think they are great!! Nice bright red. Beautiful yellow. Teal Blue. So how old are they? 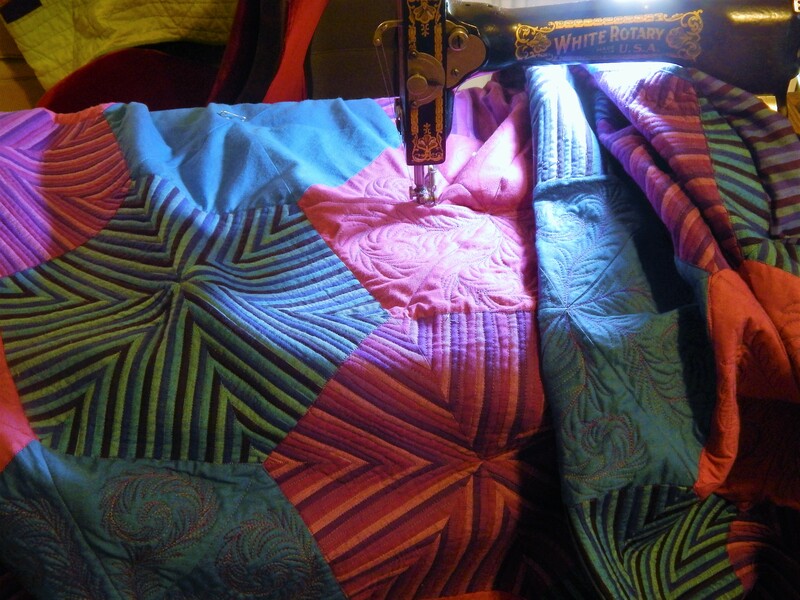 The cheddar fabric stayed very bright. The centers look rather blue or teal. I imagine that they might have been more green when new. 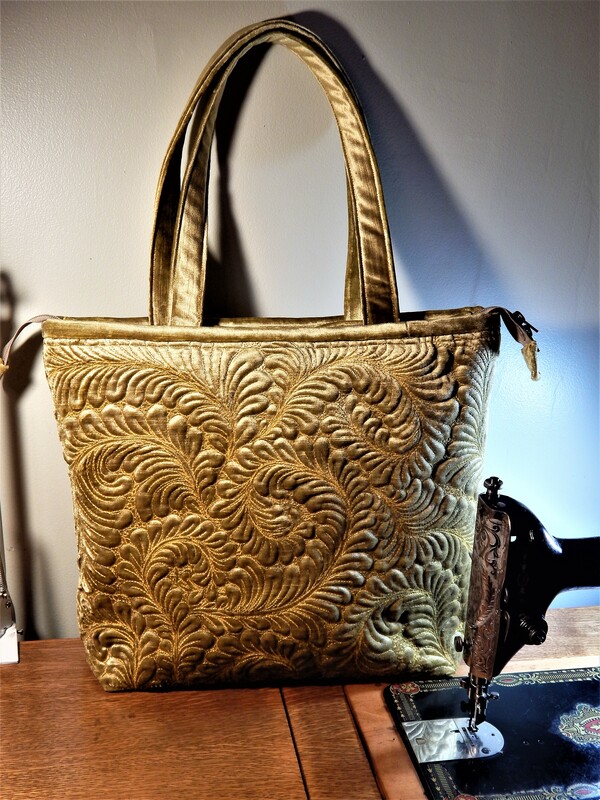 Many antique green fabric will turn teal as it ages because the yellow dye dissipates and leaves the blue. 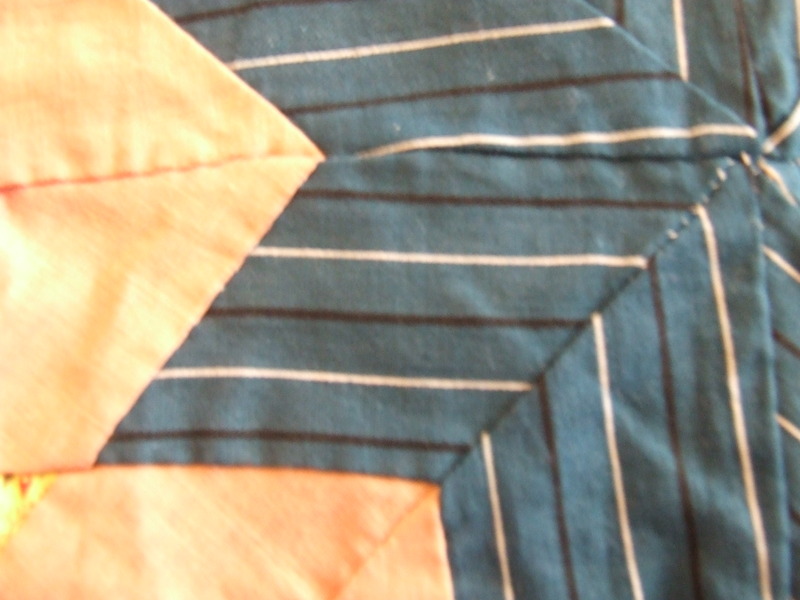 If you look at antique quilts you will often see blue leaves and stems in applique work …but they were green when new. This fabric was likely teal to start with but you never know for sure what antique fabric looked like when it was new. Anyway I have 20 of these so there is plenty to make a quilt. 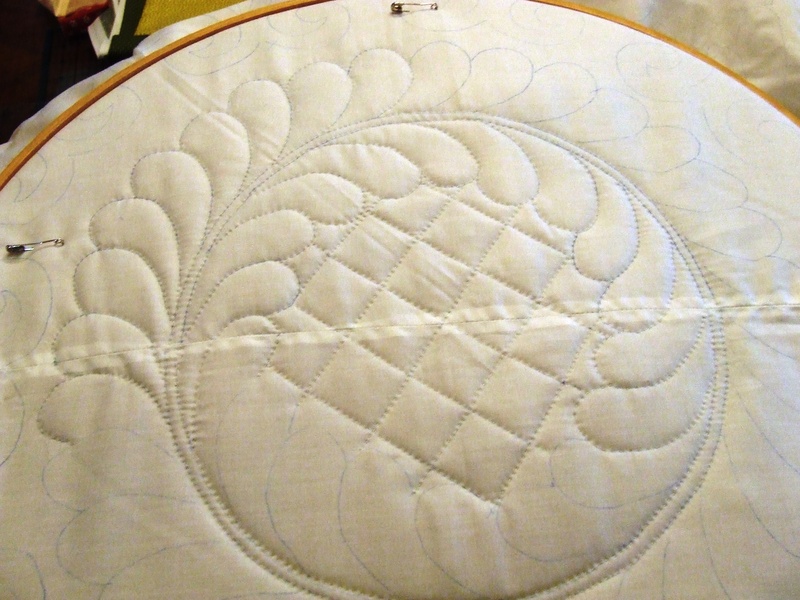 I could do a side by side setting and perhaps add some sashing. 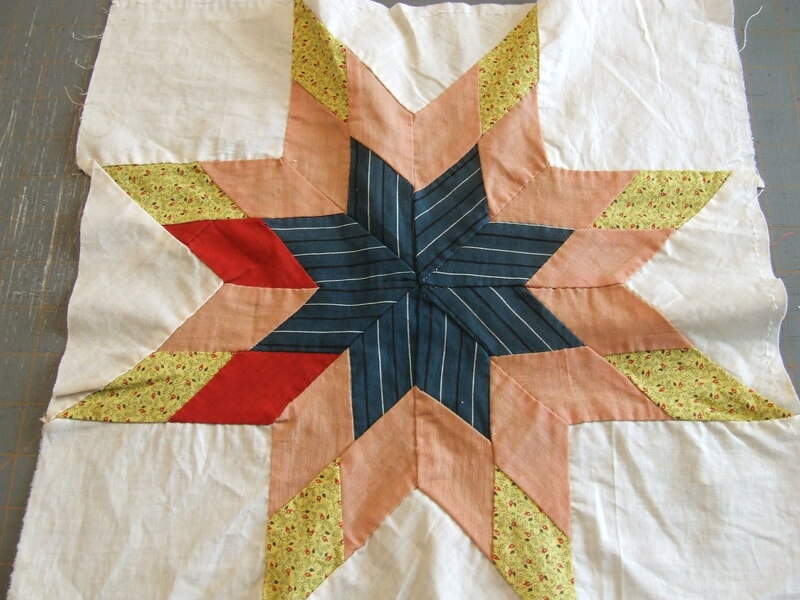 This entry was posted in Quilts and tagged antique quilt block, eBay quilt block, Quilting, Quilts. these will make a nice quilt! did you find they are all 15 x 15 or are they off a lot? I think on point would be very nice! I believe I had some of that yellow print that is attached to the pink and it came in yellow, red and blue, same print and that was early 70’s (I might still have some! ), unless it is newer and has been reproduced! Not sure about the rest, but they are great no matter what! You have such enthusiasm for taking on challenging projects and you seem to get started on them right away….I must say I don’t think that the blue was once green from what I can see and from the rest of the fabrics shown…they don’t look overdyed…there is a blue/green teal that was teal from the start – QHL list was recently talking about the teal, cheddar combo from North Carolina mostly. Are you on that list. ? The teal sure could have been teal from the start. It is very difficult for me to get a true color representation with the camera, but they are more green than they look in the picture. 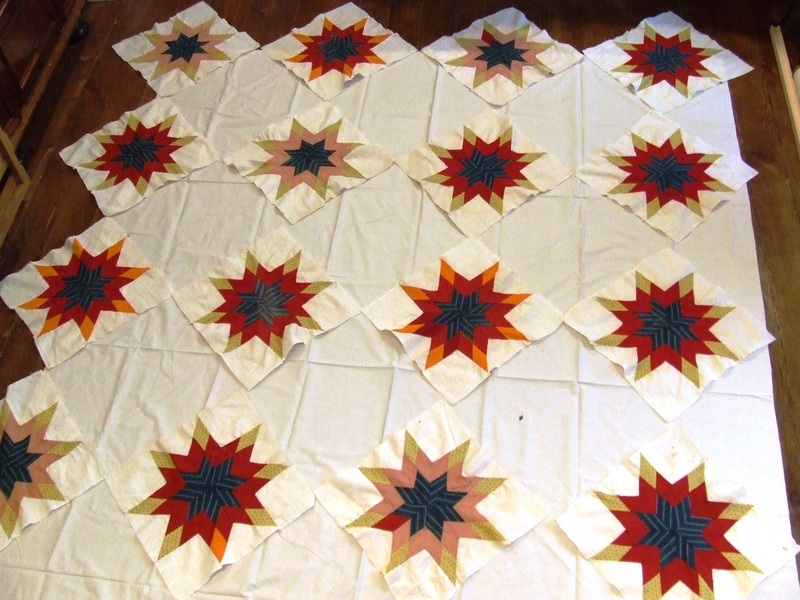 (I should try to photograph outside in natural daylight) The blocks came from a seller in Missouri but they could have originated in North Carolina….textiles have a way of traveling across the county over time . Im not on the HQL list what is it? Tim, these are lovely blocks, going to make a great quilt. I will look forward to seeing what you do with them. On Point definetle….absolutely! They look “glommed up” all close together. I vote for on point also. They are so interesting, what a treasure! But isn’t that half the fun? Taking something that needs a home and turning it into a beautiful quilt. It is lots of playing with ideas and options and working with less than perfect block sizes, but oh, so rewarding! If they could just talk! Great blocks. 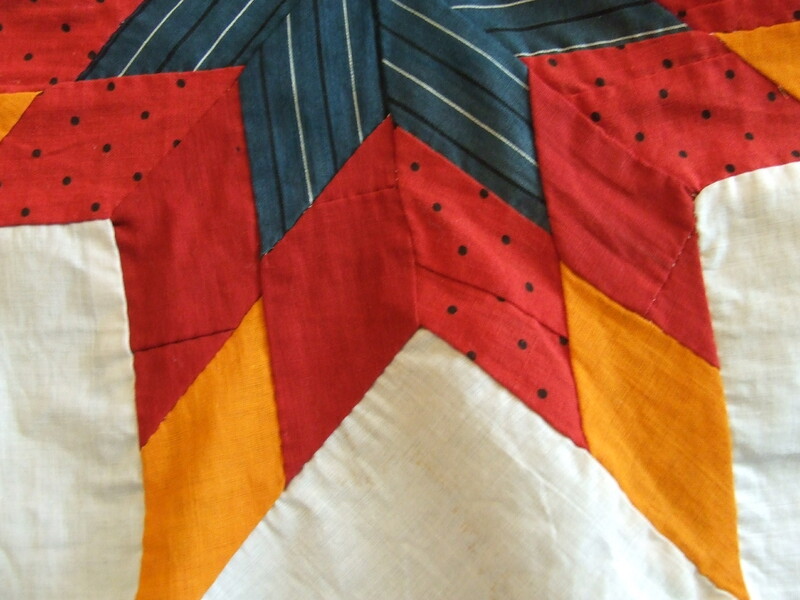 Love the frugal piecing and the sharp colors! Personally, I would set them on point. 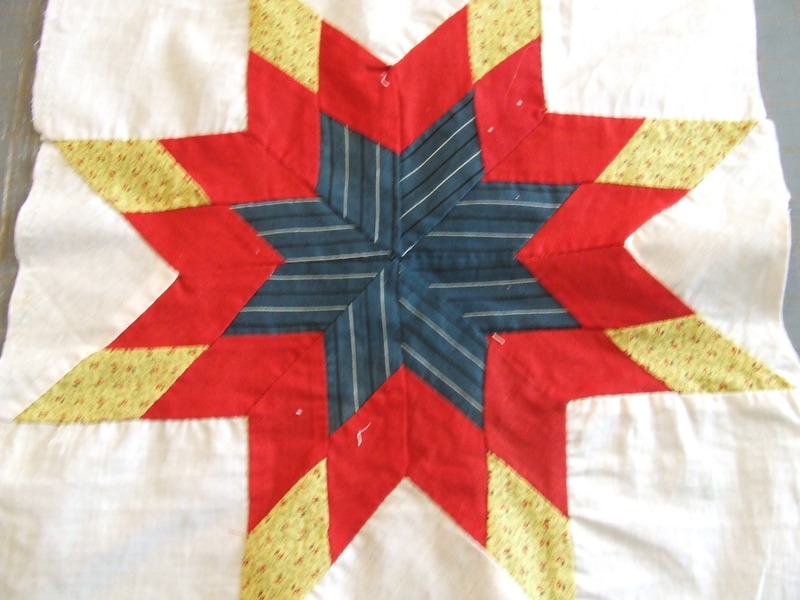 More quilt that way and the alternate squares beg to be quilted with a wreath or a spider web or another star.